Beauty content is on the rise on YouTube. 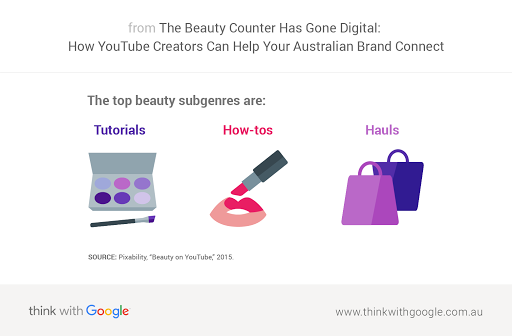 Australia in particular is seeing enormous growth, especially among YouTube content creators. Brands that invest in online video and are collaborating with these stars to create original content are driving more engagements and gaining loyal followers. From eye shadow tutorials to shopping haul videos, Beauty & Fashion is one of the fastest-growing sectors on YouTube, growing 50% from 2014 to 2015 and reaching 114B views.1 Beauty content creators are leading this growth, publishing at a breakneck pace and driving interest in more hands-on and original beauty videos. With original content on the rise and very much in demand, savvy brands are investing in creator partnerships to reach passionate fans where they spend their time: YouTube. Instead of simply uploading TV ads to YouTube, brands like i love makeup (ILM) by Bobbi Brown and Destination Beauty by L’Oréal Paris are putting online video at the forefront of their media plans, investing more heavily in the platform, and teaming up with YouTube stars to create tutorials and original content. Brands that include YouTube content as part of their core mainstream marketing strategies are reaping the benefits of their efforts. 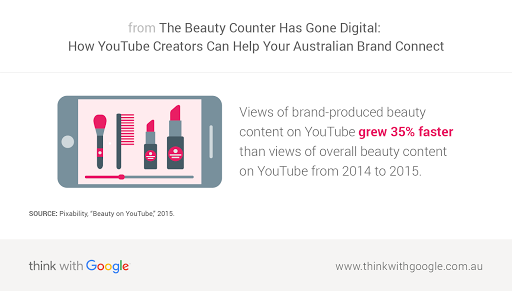 Views of brand-produced beauty content on YouTube grew 35% faster than views of overall beauty content on YouTube from 2014 to 2015.1 This growing outlet enables brands to connect with fans and educate consumers in new ways. For brands to get the most out of their video investment, they'll want to make content that connects and breaks through the clutter. The simplest approach is to think as the YouTubers do. Top Australian beauty creator Lauren Curtis connects with fans by being authentically happy, publishing often and consistently, and creating content her fans really value. Brands can follow her lead and create the types of videos beauty pupils really crave. Today's video audiences aren’t as interested in promos, production announcements, or behind-the-scenes features. Now, they want to see the goods in action. For a more in-depth look at how your brand can create a robust YouTube content strategy, check out the YouTube Playbook for Brands. 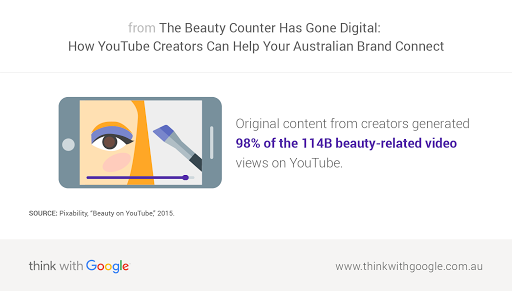 As interest in beauty content continues to rise in Australia, brands have a tremendous opportunity to create constant dialogue with consumers. Collaborating with content creators, especially top creators, can allow your brand to generate content that engages consumers and wins brand loyalty. 1 Pixability, “Beauty on YouTube,” 2015. 2 Google internal, “Beauty and Fashion on YouTube,” Australia 2015.